How to build a dashboard using various indicators. 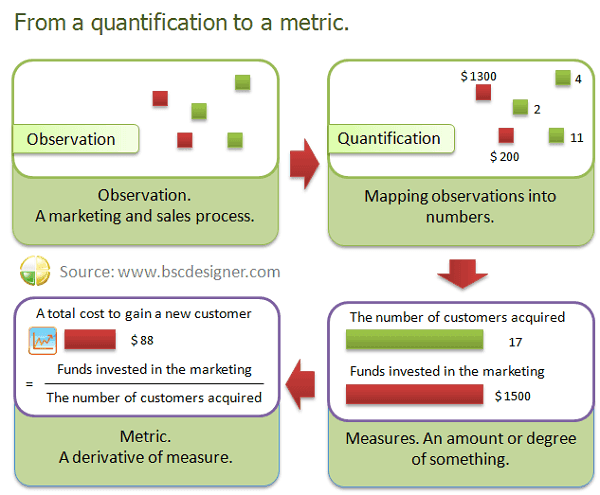 How to customize metrics according to the business model and business specific. I’ve downloaded BSC Designer to help me with my research of the BSC approach and implementation of this business framework in our company. BSC Designer appeared to be quite user-friendly and flexible. It allows us to develop indicators and construct dashboards to follow our actions and projects. I think this software is very helpful for us to complete the tasks of the Balanced Scorecard. I would like to recommend this good product to others. Thank you a lot for trying BSC Designer and sharing your opinion. As any prospect may notice, we don’t hide our software from end users. We don’t ask to fill in complicated forms before you see a demo. Anyone can download and try the software for free for 30-day period. If you find it useful, then you can buy a license, if not, one can continue using BSC Designer Light (it is free) or return later when business requirements will change. Getting together indicators, action plans and dashboards might be a tough task. One needs to keep in my many things, mainly, how all these tools are linked to each other. We recommend following a certain framework in order to obtain better results. For sure, BSC Designer will help in this way. Start with a strategy map. Strategy is not your To-Do list, neither is it a wish list. Differentiate a strategy from business goals. A strategy or in most cases in plural – strategies, need to answer why and how questions. Why you need to achieve specific objective and how you are going to do this. The why part is answered when one build a cause-and-effect linked strategy map. The how part is what you have in your action plan. Then comes KPIs. They don’t appear because of someone’s recommended to use specific KPIs, they appear because of business objectives that you have. There are certain indicators that are critical for the daily processes of your business. For example, the number of cold-calls made or the response time. Use these indicators when you build a dashboard. You will need both business tools, but a dashboard works for a process monitoring, while a scorecard serves for business management. As soon as we started trying the BSC Designer, we have noticed the power of the tool to support indicators and construct simple dashboards in order to follow actions and tasks. At this very moment I’m working in a consulting project with the CB-DMQ which is our city fire department on the implementation of a BSC tool. We are looking to optimize process and time response, as well as obtaining very structured statistics of the service offered to the community. We found in BSC Designer a very useful tool to start the study and implementation of the BSC in this institution as well in others of the public sector. It is great to see that you align your indicators with actions and tasks. One idea that might be also useful in your case is to align KPIs with business objectives as well. This will give more sense to what these indicators are measuring. Other users of BSC Designer reported that this approach allows seeing the whole picture, supports an action-oriented cultural shift, and helps to keep people on track. 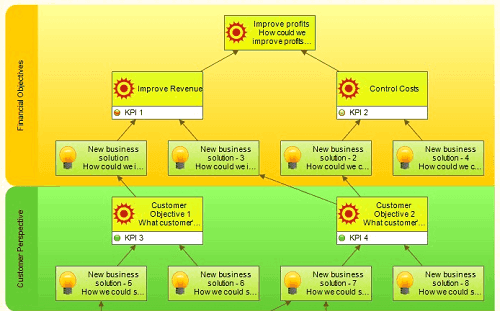 In your case those business objectives might be to “optimize process” and “optimize response time.” On a strategy map tab in BSC Designer you can add more details to “optimize process” business objectives, by explaining how you are going to do this. For example, one of the sub-objective might be “optimize response time”. You can also put on your map some specific initiatives and policies that you want to implement to optimize response time. This approach is explained in detail in the article about strategy maps. Talking about dashboards, BSC Designer can help you with this matter too. 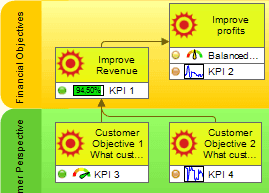 All indicators that you see on “KPIs” can be visualized on the dashboard. This will provide you with visual insights about what’s going on in your business. A dashboard is a useful part of your business systems, it helps to monitor the current performance, but don’t forget about another part that will help you to achieve a final result – a business scorecard. 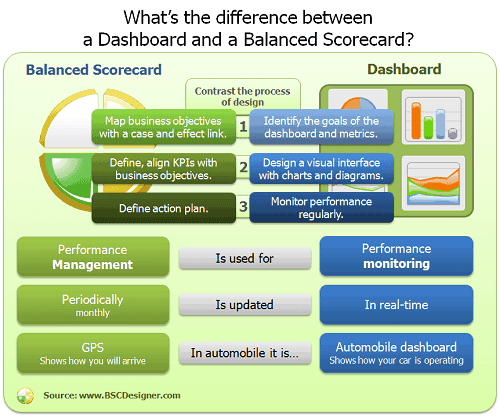 Learn more about the difference between a dashboard and a scorecard. I downloaded BSC Designer on a trial basis to help me convince colleagues of the utility of this product for our strategic work that implies the usage of the Balanced Scorecard approach. I found the combination of a graphical interface, customizable indicators and data entry forms very easy to adapt and to use. I like that there are overrides for nearly all of the functions, so customizing for a non-profit (as I am doing) is not as hard as on other platforms that I’ve seen. I think the software is useful for both experienced and new folks using the Balanced Scorecard approach. Duncan, thank you for your feedback. It is great that our BSC Designer helped your non-profit organization with the Balanced Scorecard. I believe that this business framework can be used equally well by international corporations, small business, non-profits or individuals. At least that is what we see in the results of case studies. I was commenting on a feedback of a user from France and mentioned all of the major benefits of having KPIs in BSC Designer. In our consulting projects, our major concern about KPIs is that they are taken from long list of KPIs on the Internet or copied from other companies. In this way, even the best KPIs won’t work. The better approach that we always recommend is to define business objectives first on the strategy map. Show how they are related to each other, link them to an actions plan and only then start thing about KPIs. Hopefully, this advice can be applied in your organization as well. In your case a top-level goal will be “a world free from malaria” then should be cascaded to more specific goals and objectives. Once these objectives are defined you can add action-oriented strategies and action plans. I’m sure that you already have all these documents and maps in your organization’s plans. What BSC Designer can do is to help you with automation and visualization of many important aspects of this plan. Have a look at this sample strategy map to get an idea about what you can expect from BSC Designer. We wish you and your organization all the best in fighting with malaria. I am working in management consultancy and professional services area, I want to use BSC designer as a tool to help in strategic planning, balanced scorecards, KPI/dashboard and general strategy implementation/execution projects for my clients in the middle-east region. I think BSC Designer is an excellent tool within its category. Even the functionality provided in the free BSC Designer Light is quite impressive. The tool is easy to use and its functions are self-explanatory. Providing the overview in YouTube makes handling the tool easy and straight forward. This is all good! I look forward to test more advanced versions that are more enabled and have integration capabilities with popular operational software to get the raw performance metrics and calculate the KPI automatically and without manual intervention. Glad you found that even a free edition of BSC Designer is feature rich. Compared to Standard and PRO, the light edition has only a basic functionality that allows one to manage KPIs only, but this is still a good beginning. This edition is especially popular within education professionals. With this freeware Balanced Scorecard software one can share KPIs with class and to have some basic reports available. 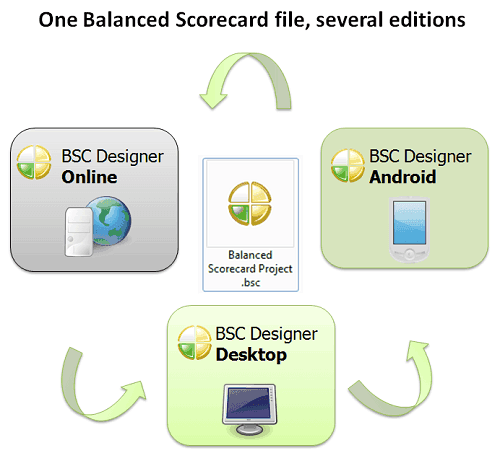 When a Balanced Scorecard project growths, one can update its software effortless to Standard or PRO editions or even upload BSC project online. It is all possible with .BSC file format. Few words about BSC Designer in a Middle East region. We have a separate webpage that highlights some customers and case studies. For you as a consultant, it will be much easier to provide BSC Designer to users in Middle East region as it was localized to the Arabic language. Finally, it worth trying the latest edition of BSC Designer PRO were strategy map design with improved significantly. It is now easier not only create a strategy map, but maintain it. You can combine automatic map building with manual placement of objects. For example you can customize some objects or links and then “lock” then. In this way BSC Designer won’t change these objects the next time you rebuild a strategy map. I am using BSC Designer to manage KPI for a BI project in one of the biggest metal manufacturing companies in my country. I was using BSC Designer for a KPI and BI project for the biggest metal manufacturer. The software has a user-friendly interface. I find it really useful for the mentioned scope of tasks. I did not think I could solve this project fast, but now we have a KPI project and all stakeholders are satisfied with the results. I’m going to promote this software to others and hopefully they will gain the same idea about the benefits of the software as I did. I’ll be happy to spread the word about your software. We are glad to hear that BSC Designer has helped you with KPIs and your BI project. We are sure, that this is actually just a beginning. With PRO editions of BSC Designer one can manage not only KPIs, but strategy maps, business objectives, dashboards, notifications to stakeholders and so on. You mentioned that you implemented KPIs in a metal production company. Recently we did a case study with a manufacturer from Argentina. Check it out to learn about typical pitfalls that you might face during an implementation of the Balanced Scorecard or KPIs. Also, one of the ideas for improvement is to integrate in BI project not just a set of KPIs, but the whole Balanced Scorecard. We were talking about this in an article Integrating Balanced Scorecard and Business Intelligence (BI). 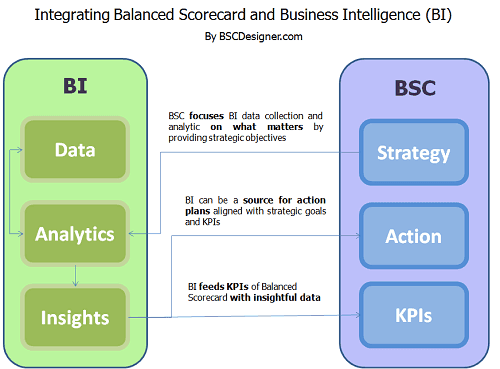 You might find that ideas from this article help to convince top management to add to the current BI system a more result-oriented Balanced Scorecard. As for promotion of BSC Designer software, have a look at our Partners section. If you think that you can reach many potential clients, then it worth signing up with a partner program. BSC is an easy and powerful way to manage a business and I appreciate the possibility of using the methodology with a simple and user-friendly BSC Designer tool. I’ve downloaded the software and started planning my company’s measures and initiatives. BSC Designer helps me to ask the right questions and to look for the answers about the business as well as to put the answers into ready to use form. I do agree about the Balanced Scorecard, it is a really powerful way not just to measure business performance, but to manage it. As it often happens with good ideas some of them are interpreted in a wrong way. For example, with BSC we see that many people treat scorecards as a measurement tool with a set of KPIs. Such ideas are confusing, as in most cases companies deal with simple metrics, not KPIs, as wel as trying to estimate a performance index of a company. The business scorecard approach will work much better if applied in the right way. 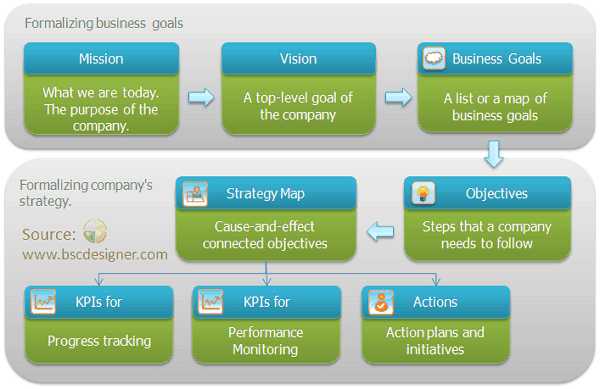 It need to be started with properly designed strategy maps, definition of business objectives and adding leading KPIs. For users of BSC Designer we have a template project that, as you mentioned in your feedback, will serve as a ready-to-use form/template to start a business scorecard project in the proper way. If designed in the right way a balanced or business scorecard is much more powerful than just a measurement system with metrics. A recent survey confirmed that companies that use a correct approach to scorecards that is automated with how a professional performance management software are very satisfied with how scorecard business tool influences their ultimate performance. I’d like to ask other business professionals to share their experience with BSC Designer as well. Feel free to write in the comments if business/balanced scorecard approached helped your company to align business strategy with measures and initiatives. We use BSC Designer to make a synthesis of a dynamic view of KPIs according to Kaplan and Norton Balanced Scorecard (BSC). This product is easy to use, it has a good interface for a quick understanding of BSC concept. In this software it is possible to fine tune Key Performance Indicators by using base-line, target (objective) and update intervals. Additionally, it’s accessible in different languages (including French that was important for us). 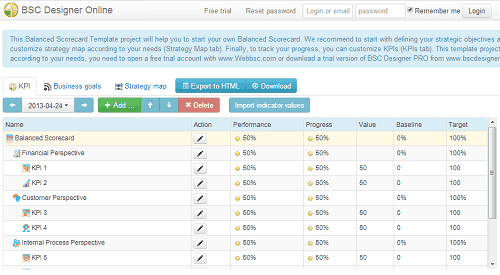 The Balanced Scorecard Wizard is a nice way to help when starting to use BSC Designer. Educational videos help to gain knowledge and understanding of KPIs and the Balanced Scorecard. Last but not least, for better appearance of an indicator, you can change its icon and use one of the icons available in the icon library that is delivered with BSC Designer. Another question is how the performance of an indicator depends on its value. Most scorecard software suggest using a linear function. In BSC Designer you can use a linear function for maximization or minimization (see “Optimization” drop list) or you can define your own performance formula. Balanced Scorecard Wizard that you mentioned is a basic mean to create a business objective and associate it with a measure. Another approach is to template and customize it according to needs of the company. Some users prefer this approach. The instructions given are for BSC Designer Online, but you can use similar templates in BSC Designer desktop. By the way, you mentioned the Norton and Kaplan Balanced Scorecard. I believe that in this type of the scorecard KPIs play a minor role. The major idea is to put on the strategy map business objectives and show how they are related to each other. Following the steps that are suggested in the BSC template, you will actually build a Balanced Scorecard that meets K&N ideas much more than a list of KPIs. I am planning on implementing the Balanced Score Cards to improve the management process of the company. BSC Designer is a good tool to solve business problems and to have a complete view of the company. It helps employees to work together in all aspects and to focus all objectives in the same strategic direction. In this way you can direct the effort of you team. One can also control possible gaps or deviations of KPI values and compare the real values with the expected ones. As a result it is possible to adjust work processes to achieve expected values. The key is to have the appropriate indicator to estimate and assign a value to the key factors for each responsible center in the company. Magdalena, thank you for sharing your feedback. Some of our case studies confirm what you mentioned. The Balanced Scorecard approach actually helps employees to see the “big picture” of the business and focus their efforts on one strategic direction. As for the choice of appropriate KPIs, I think it is a really interesting question. The approach that we recommend is to start the Balanced Scorecard process from mapping appropriate business goals on the strategy map, which is available in BSC Designer. One can use a template to make the process easier. Still there are possible situations when an executive has to start with KPIs as a strategy is not clear yet. As you mentioned, another key aspect of the BSC are benchmarks. KPI only tells us where we are, but doesn’t tell us anything about the current state. If this state is a good one or it needs to be improved. In BSC Designer each KPI has a “target” field where a user can specify expected results and a “baseline” field where a user specifies the starting point of an improvement. After a few hours I could see that it’s a wonderful tool for people that wish to implement a BSC (Balanced Scorecard). It is a friendly software that presents the perspectives (financial, customers, inside processes and learning and knowledge) and you can include all parameters and easily control it, and you can even import parameters through SQL. We thank the authors of the strategy planning blog for a detailed review of our software. One thing that we have noticed is that people discover our Balanced Scorecard software from one side only. Some download it because they see that it works with strategy maps, other prefer to focus on KPIs or dashboard. Good news! If your requirements change, you don’t need to change the software. We have implemented inside it all of the possible features that support the Balanced Scorecard functionality and what is more important, practical usage of the concept. For example, talking about four perspectives of the Balanced Scorecard that were mentioned in the review. The software supports these perspectives, but we know that some businesses are changing and adding more perspectives in the business scorecards. BSC Designer software supports these changes and allows uses to customize existent perspectives or add new ones. As for defining initiatives, it can be as simple as attaching a file. Actually, this is a part of a bigger process called alignment. KPIs, objectives, action plans won’t work properly unless aligned with each other. 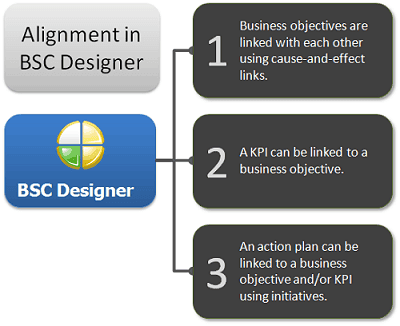 For example, in BSC Designer it is possible to link a KPI to a business objective or, as was said in the review, add an initiative to a KPI or business goal. We have all of the necessary functionality for the Balanced Scorecard because we were listening to our customers. And if you have something that would make your usage of the scorecard or KPIs easier, don’t hesitate to let us know. Acting as a consultant, I can suggest the use of software to my customers. I also challenge this model to evaluate companies. BSC Designer is easy to take in hand. Links with existing data seems to be a little bit complicated. I would like to know if it is possible to link with OpenERP. Also, I need to understand better how team working is possible without risk of destroying the existing data. At this point it seems that the software works only on a PC… do you have plans to issue a Mac version? How secure is the cloud version? Do I risk that some essential information leaks to competitors? Why are some functions that exist in the PRO version not included in the online version? Thank you a lot for your feedback. We like opinions like this, that not only contain some good words about our software, but where users ask more questions. For us it is an opportunity to demonstrate various possibilities of our software. Talking about accessing external data you have several options. You can access an external data base using “SQL indicators” or if your data is in Excel, you can link your KPI to a value in Excel. Another option allows you to access any data source that can be queried and put that respond in XML format . Here is a guide that summarizes three ways to import data. 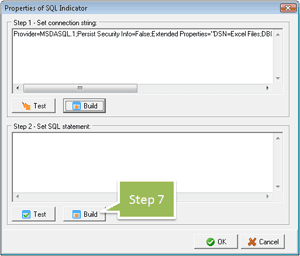 Regarding your specific question about linking to the database of external product (OpenERP): basically you can use SQL indicators to link to the OpenERP database, but for sure, this will require some IT specialist to setup appropriate access queries. We have contacted authors of OpenERP to see if we can make the integration easier. Teamwork can be organized with BSC Designer in several ways. The most popular one is using imported indicators. You create a scorecard (for example for HR) and a top manager can import data from HR scorecard into the top level scorecard. The access will be ready only, so there is no risk of deleting data that is managed by another person. A few words about various editions of BSC Designer. Now we have desktop editions for Windows, mobile edition for Android, and a web-based edition. We don’t plan to create a Mac version, but I know that some people have successfully used BSC Designer under Windows emulation on a Mac. Also, a web-based edition is available and it is cross-platform. Talking about safety of your data BSC Designer Online is hosted on Heroku, you can check out their security policies. This service provides the security measures of the highest standards. As you have noticed, there are differences between the functions available in PRO and web editions. First the feature appears in desktop editions, then if it is possible technically, it is developed for the web-based edition. There is always a gap between two editions, but all major functions are already there.